While helicopters are used in some countries to ferry golfers across vast courses, Russians have literally taken golf to a whole new level – playing the game while flying a helicopter! Golf, polo and flying enthusiasts have tripled their efforts in entertaining Moscow's savvy jet set crowd, with fans of the dizzying new game – heli-golf – holding a high-flying tournament in the Moscow region this weekend. Invented by a helicopter company and golf and polo club, the game was first played in 2013. This week, the heli-golf competition was part of the Tseleevo Winter Open tournament, which was held some 40 kilometers north of the Russian capital. 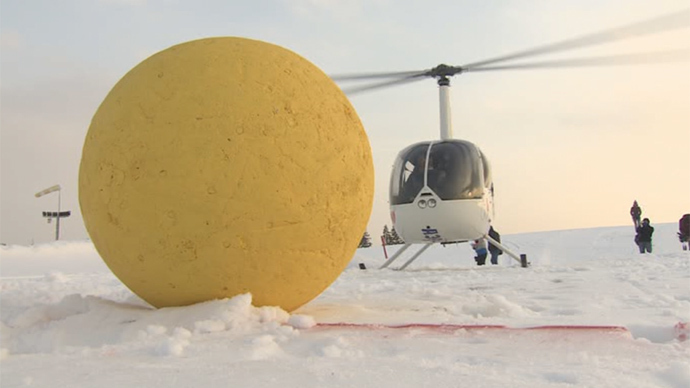 Playing in teams, participants do their best to whack a large, one-meter diameter ball on the snow from a helicopter. All the while, the chopper is flying just 4-5 meters above the ground. The golf clubs used by the heli-golfers weigh ten kilograms and are five meters long. They are made of a cane stick and a large hitting base. The player has to navigate the ball as fast as possible through a snowy obstacle course. If that sounds hard, it is! One of many challenges competitors have to face are the wind flows caused by the helicopter blades, which constantly change the direction of the ball's movement. Organizers say heli-golf is played in teams of three, where only the combined efforts of the pilot, the strength of the golfer and the precise directions of the navigator can help the players clinch victory. But playing a round of heli-golf will cost you a pretty penny, with one flight for up to three people costing 18,000 rubles (around $300).